We've reviewed cover levels to find the UK's best bicycle insurance companies. Our list is not based on price, although we highlight where insurers may be cheaper for some people because they don't take into account where you live. Following the surge in people taking up cycling a number of specialist insurers have launched. Although a number of well-known brands offer bicycle insurance some of the new companies are created for cyclists by cyclists and may also offer a better level of customer service. You can see our reviews of the top providers here. Its max cover for a single bike is £15,000 and the limit for total bikes is £50,000. It offers cover for travel, events, accessories and has a big multi-bike discount. It insurers professionals and even covers Team Wiggins. In 2018, it launched cheaper cover for entry- and mid-level enthusiasts. Policies come with a free DNA+ marking kit. Get a Yellow Jersey quote online. Good for: serious cyclists, competitions and events in the UK and abroad, high-value bikes, pros, enthusiasts, holidays in Europe. A comprehensive policy for cycling enthusiasts that covers accessories, events, breakdown, race fees and worldwide travel. It covers bikes worth up to £20,000 and is underwritten by Hiscox, an insurer behind many specialist UK policies. Bikmo was named Best Bicycle Insurance Provider at the 2016 Insurance Choice Awards. See your price on the Bikmo website. Allows you to set up cover for you first and foremost and your bikes second. It acts like a specialist health insurance policy for cyclists and offers payouts for physio and if you break a bone. You can buy liability and personal accident cover without insuring your bike. Get a quote for PedalSure's policies or read a review of PedalSure's cycling cover. It’s been around some time and offers a highly modular policy, allowing you to include or exclude almost every element of cover, giving lots of flexibility. There are options for team and coach cover and no extra charge for living in a city (excluding London). There’s a 20% initial discount. It covers bikes up to £12,500 and provides good cover for those considering long trips abroad. It includes roadside recovery as standard. It covers bikes up to £10,000 and does not seem to price by postcode, which means it could be cheaper for some city cyclists. Once you have a price it allows you to add various features such as five year new for old cover, competition use and personal accident cover. Read reviews of these providers here. In 2017 in the UK our collective mileage was up 25% over the last 15 years to over 5 billion kilometres cycled in 2013 and two million people across Britain cycle at least once a week. But insurance tailored for cyclists is a new development. We also use the combined buying power of our members to negotiate fairer and cheaper deals with insurers. Our cyclist offers include 10% off a Bikmo policy. Or click on the name of the insurer in the table to get a quote. Insurance protects against financial loss and inconvenience when an unexpected event happens. That could be an injury, damage to your bike or someone else’s property. 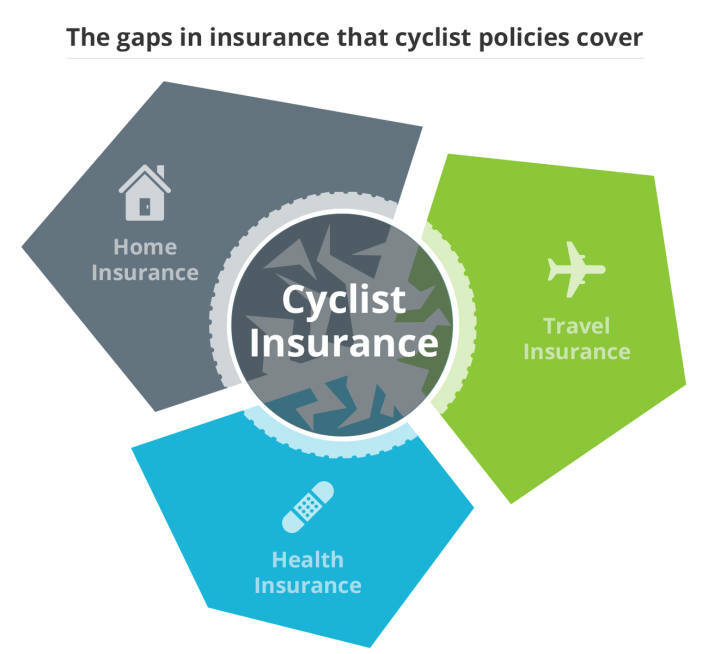 Those sound like the enigmatic arguments for getting any kind of insurance but because cycling is so physical and involves vulnerable and valuable equipment it is something bike riders should consider. Cyclists of all abilities are at risk, even team Sky had bikes stolen during the 2014 Tour du Haut Var. It is possible to cover certain risks using a combination of home, health and travel insurance. But that can be expensive and leave surprising gaps in cover, especially if you don’t have all of those policies. Dedicated cycling insurers have emerged to package the relevant bits of each of those policies into one product. Cyclists might think they’re aware of the dangers of being in the saddle but there are many scenarios that can cost more than expected or cause major inconvenience if not covered. Being taken out by black ice, a pothole or another racer; scratching a car on a busy road; or having an expensive bike targeted by thieves can happen to anyone. As well as the obvious headline financial impact related to these mishaps there are other costs that can add up. Bought By Many’s resident roadie found this out after his recent crash and looked into how insurance would have helped. Some of the more unexpected expenses include paying for a taxi to hospital and work, the cost of takeaway meals if you can’t cook because of a broken arm, getting a physio appointment if the NHS waiting list is too long and lost entry fees for races you can no longer enter. The best bicycle insurance offers comprehensive cover for serious cyclists, have good customer feedback online, accessible quote processes and are more competitive than other cycle policies. However, selecting the best insurance policy for your needs will depend on how you use your bike. While the policies we've highlighted offer good all-round cover for many activities, there are particular features that may be more beneficial to certain cyclists. Being on the road during rush hour brings greater risks. Along with the possibility of causing damage to yourself, your bike or others, cyclists have to find somewhere safe to store their bikes. The total cost of bicycles stolen from UK train stations is over £1.5m a year, according to Velosure. Although the biggest fear for many cyclists is being injured by a vehicle. PedalSure is unique in that it allows you to choose cover for yourself, rather than your bike. Some cyclists feel their home insurance provides enough cover for their bike – it includes public liability cover outside your home and may meet the costs of replacing a bike. But PedalSure gives you an extra level of protection that would pay out if you are injured. It’s almost a cheaper, tailored health insurance policy for cyclists. It pays out for broken bones, physiotherapy and out-of-pocket expenses you might incur, such as having to get a cab to work for a few days. Other providers worth considering are Bikmo , PedalSure, CycleGuard, Yellow Jersey and Velosure because of their cycle breakdown feature. It is similar to a car breakdown policy and can cover the costs of transporting a broken bike to a shop for repairs and onwards travel. All of the above cycling policies also offer public liability to cover any legal costs or payouts if you’re at fault in an accident. CycleGuard makes a point of not charging more if you live in a city, which could be beneficial for many commuters. Don't forget you can get 10% off a Bikmo policy by joining our group. Standard travel insurance has limits on the value of individual and total items you can take with you and quality cycling equipment can easily exceed them. And they are unlikely to cover your bike while it is in the hold of a plane. Also, many policies class cycling as an activity that requires a higher level of cover and activities such as races might be completely excluded. Although you will need normal travel insurance when going abroad, having a cycle policy means your bike is covered and you won't have to pay for extras on your travel cover. Bikmo and Yellow Jersey offer worldwide policies and both have features that payout if your bike or the box is it being transported in are damaged in transit. However, it's worth noting that worldwide policies often do not offer public liability cover for certain countries. For example, Bikmo and Yellow Jersey do not provide public liability for the USA and Canada. Which might not be great if you want to go on a Rapha trip to the States. Other providers with worldwide policies include Cycleplan, CycleGuard and PedalSure, which says it offers a true worldwide policy without any restrictions. But be sure to check with them if there are any liability exclusions. Find out about some of the best winter destinations for cyclists and cover for triathlons at home and abroad. Because races are fast paced and close quartered it’s no surprise that crashes happen. As mentioned previously, a Bought By Many colleague broke his arm in a race. Yellow Jersey, Bikmo, PedalSure and Velosure include race cover as standard. As you might guess from the name, Yellow Jersey specialises in training and racing and will even cover fees for races you might not be able to attend after a crash. Because cycling events vary so much it’s important to check your policy to ensure the events you’re interested in are covered. Most should include leaving your bike in a triathlon transition area and sportives. Many events will require you to have some form of cover before you enter. Even if you take out bicycle insurance it’s vital that you are security conscious. You can invalidate your cover by using the wrongs locks or storing a bike incorrectly. Most insurers should provide you with a list of locks that are accepted under their policies. If you have to buy a new lock make sure you keep the receipt because if it disappears along with your bike, you’ll need to prove it was secured with an approved device. Another security issue to consider is theft from your car or a vehicle. Many home insurance policies will not cover your bike if it is stolen from your car but Yellow Jersey and CycleGuard advertise in-vehicle cover. Be sure to always read the small print because there are conditions you have to meet to make a claim, for example, CycleGuard says the bicycle has to be "secured through the frame using an approved lock, to the roof or bike rack or if the vehicle is suitable, stored out of sight". Some providers offer security freebies. A Yellow Jersey policy comes with a DNA+ marking kit worth £36 and other companies provide discounts on well-known cycling brands and deals on the first year's premium. Another way to get a limited amount of insurance is by joining organisations or charities such as British Cycling, Total Cycle Assist or CTC. Many cyclists will have to do this anyway because a British Cycling membership is required to enter most races in the UK. These schemes charge a small fee to join, however, the cover is less comprehensive than what you get from a full insurance policy. Learn more about the best cycling insurance companies and find out what their customers think by reading our expert reviews. Our members have access to exclusive insurance discounts including 10% off a Bikmo policy and a 10% discount on a Stirling home insurance policy for cyclists.